Dragons Eye: An exotic orb lamp, handcrafted using rich claret glass mosaic pieces with twinkling speckles of gold. The gold speckles are followed through to the antique gold cap, which completes the design. 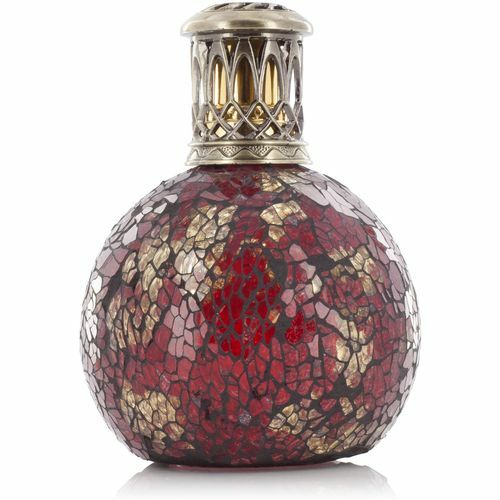 Ashleigh & Burwoods fragrance lamps are also known as: Catalytic Lamps, Effusion Lamps and Diffusion Lamps. Please note that this product has been individually handcrafted and each piece is therefore completely unique - no two are ever identical. ADDITIONAL INFORMATION: Fragrance Lamps are intended to be used only with Ashleigh & Burwood Lamp Fragrances - Fragrance Lamps are not the same as Oil Burners and cannot be used with Fragrance Oils as this will damage the lamps wick.